UK 76 (detail), 1976. Set of 11 archival inkjet pigment prints printed 2016, 40 × 60 inches. Copyright Victor Burgin, courtesy the artist and Bridget Donahue, New York. 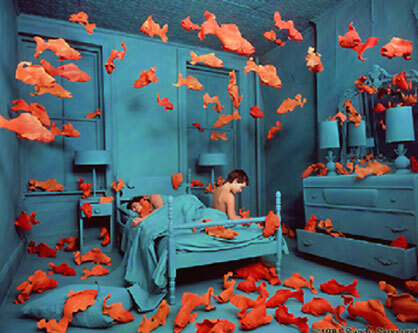 Sandy Skoglund was born in Quincy, Massachusetts in 1946. Skoglund studied studio art and art history at Smith College in Northampton, Massachusetts from 1964-68. She went on to graduate school at the University of Iowa in 1969 where she studied filmmaking, intaglio printmaking, and multimedia art, receiving her M.A. in 1971 and her M.F.A. in painting in 1972.